A few years ago, master trumpeter and jazz educator Kelly Rossum suggested a partnership between the MacPhail Center for Music, where he heads the jazz program, and the Dakota Foundation for Jazz Education. The result was the first edition of the Dakota Combo, a highly selective ensemble of the area’s most talented high school jazz musicians. 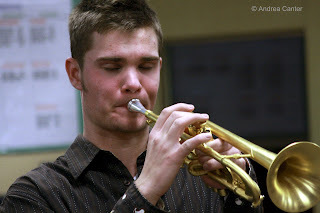 After a successful first season culminating in a performance at the Dakota Jazz Club with guest artist Bobby Watson, the project expanded to a full school year in 2007-08. One of the added components was a day of school visits, in which the Combo presented music, invited students to jam, and talked about their inspirations and aspirations. While there would continue to be an annual student clinic with the guest artist, the school visits would put the Combo musicians in teaching roles. 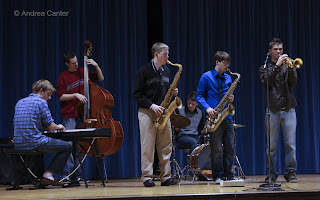 Last week, the musicians of the third edition of the Dakota Combo shared their passion for jazz with peers and younger students with a day of performing and interacting with band and music classes at Minnetonka High School (home school for Combo musicians Jake Baldwin and Cameron LeCrone), Sheridan K-8 Fine Arts and Ramsey K-8 Fine Arts, both in Minneapolis. At each school, the Combo offered a range of tunes, including arrangements of standards like “Cherokee” and “On Green Dolphin Street,” and at least as many original compositions. Original repertoire is a significant part of the Combo experience, and their forthcoming recording session (another new component of the program) will include only original music. 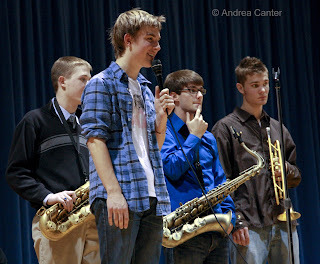 Photos: (Top), Jake Baldwin blow on trumpet at Ramsey; Joe Strachan and cohorts answer some pithy questions from Sheridan middle school students; the Dakota Combo on stage at Sheridan. Photos by Andrea Canter.